Note -Translated the text via google. This is not happening on the English version and I cannot read Russian to tell if it is correct there. @ABorbaWMF: It might be good to also include the original untranslated text. Associating a project tag is very welcome. 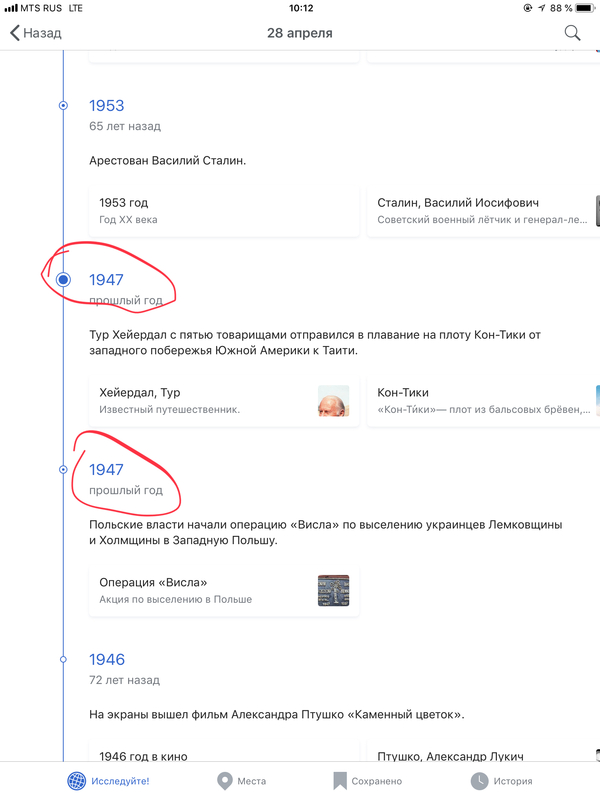 Going to https://ru.wikipedia.org/wiki/Заглавная_страница and looking at the В этот день section, it says 4 мая which is still today (at least in some Russian timezones). 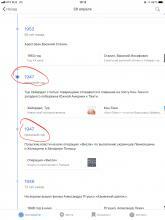 Clicking the last listed item called 1979 — Маргарет Тэтчер стала первой женщиной — премьером Великобритании. 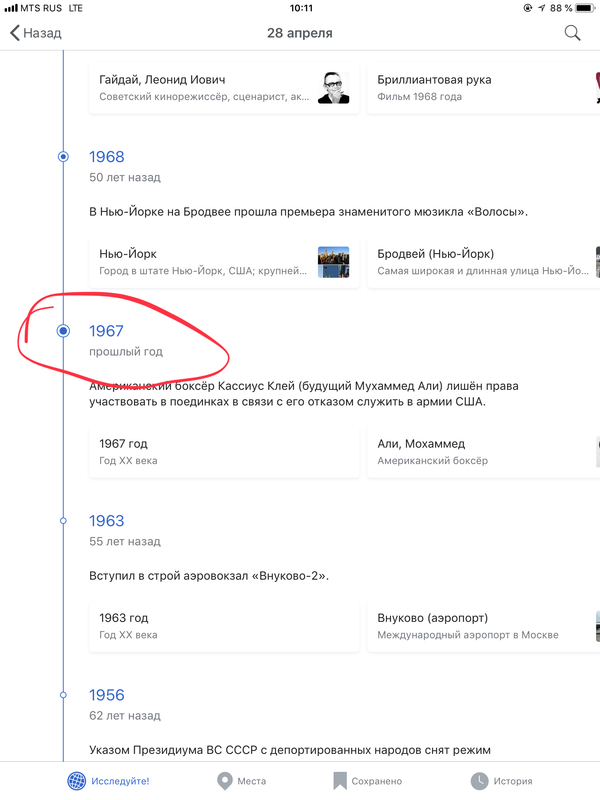 the article at https://ru.wikipedia.org/wiki/Тэтчер,_Маргарет says that her office started on 4 мая 1979 года so I don't see a bug? Note that I am logged in. This might be the very same issue as T192419: Problema con el cálculo de la edad / Problem with age calculation which I could not reproduce either. @ABorbaWMF: I do not know how to get to the view that is shown in the screenshots. Is that in a web browser? Or is that some app? @Aklapper Sorry! I was inputting a few tickets and I must have forgotten to tag this one properly. This is an iOS App bug. LGoto added a project: iOS-app-v5.8.2-Manatee-On-A-Model-T.
Mhurd removed Mhurd as the assignee of this task. Mhurd added a subscriber: Mhurd. JoeWalsh moved this task from Ready for Development to Waiting for Build on the iOS-app-v5.8.2-Manatee-On-A-Model-T board. I am still seeing this (I think) on 5.8.2 (1420). when I scroll down I am seeing the same characters as in the original description. • Vvjjkkii removed JoeWalsh as the assignee of this task. • Vvjjkkii edited subscribers, added: JoeWalsh; removed: Aklapper. CommunityTechBot assigned this task to JoeWalsh. 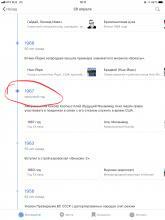 CommunityTechBot renamed this task from cldaaaaaaa to On this day in Russian possibly miscalculating number of years. CommunityTechBot edited subscribers, added: Aklapper; removed: JoeWalsh. JoeWalsh added a subscriber: JoeWalsh. LGoto removed a project: iOS-app-v6.0.1-Walrus-On-A-Golf-Cart.